Learn how to cut your tech expenditure by half. Organisations spend more on IT support and maintenance rather than improvement and innovation. This is backed by various research showing that companies averaged 72% in their IT spending for keep-the-lights-on (KTLO) activities. KTLO is that portion of IT expenditure used for performing daily operational tasks and for routine IT systems or hardware maintenance. Although KTLO is necessary, from a business perspective, it does not contribute directly to business growth. 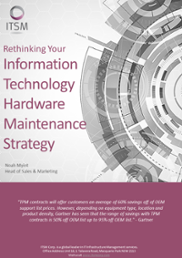 Organisations can make considerable savings by reviewing and rethinking their hardware maintenance strategy. Complete the short form to download the eBook.